E. Jeffries Standard Leather Foal Slip. This foal slip leather headcollar is made by E. Jeffries in Walsall England from 5/8 inch (small) or 3/4 inch (medium) quality bridle leather. It is available in these 2 sizes to complement head size but in havana brown with self-stitching only. Make your choice of size using the pull down menu. Sorry there is no product image of the Standard Foal Slip but it is very similar in appearance to the Best Quality Foal Slip HCBFS except that the leather is stained on the underside. 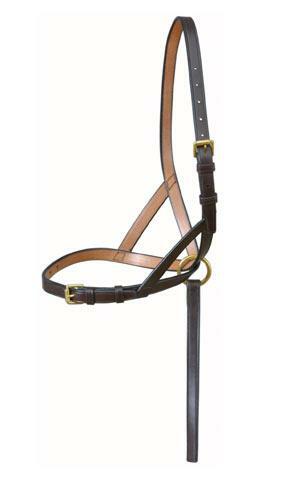 This leather browband for horses is made by E. Jeffries in Walsall England from best quality English bridle leather. The browband is covered in ribbons of 3 colours to form a traditional diamond pattern on the horse's brow. It is available in Shetland, pony, cob and full horse sizes. Make your choice of size and colour using the pull down menu. Please note yellow is no longer an option as we are unable to sources cotton velvet ribbon in yellow.